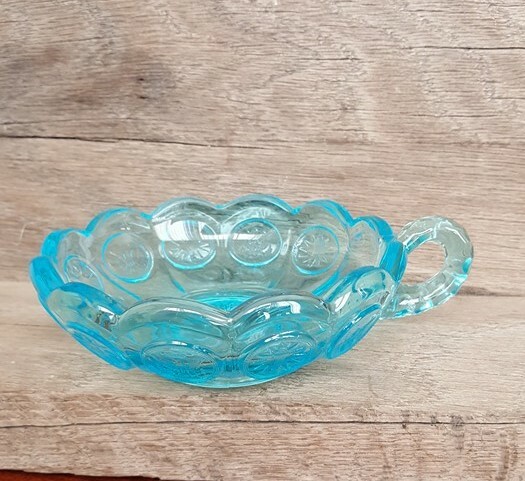 Fostoria Coin Glass Nappy in Sapphire Blue, Bargain Shack offers Boyd Glass, Mosser Glass, L.G. Wright, and Contemporary Collectible Glass including Vaseline Glass - J.B. Scottie Dogs, Pooche, Animal Covered Nests, Toothpick Holders, Salts, Glass Animal Figurines, Clowns, Dolls, Slippers, Vehicles, and More! Here is an elegant Fostoria Coin Pattern Nappy in Sapphire Blue with a cup style handle. It stands about 2.5 inches tall and is almost 11 inches across the top not including the handle. Fostoria closed its doors in 1986 after almost 100 years of making glass. These pieces are getting harder to find and this is a great color.